Christopher Dillon's presentation "A Foreigner Buys Property in Japan"
The following is a transcript of a presentation entitled A Foreigner Buys Property in Japan that was delivered to the Japan-America Real Estate Coalition Office (JARECO) in Tokyo on July 27, 2016. A video of the presentation is available here. In my presentation, I will tell you about my experience writing Landed Japan. I will also describe some of the lessons that I learned buying property in Tokyo and explain why Japan is an attractive place for foreigners to purchase property. I hope to help you understand how foreign buyers see the Japanese property market and help you serve non-Japanese customers more effectively. To do that, I’m going to look at the recent past and the current market. I’ll also make some predictions about the future. Let me start with some background. I am a Canadian entrepreneur who has lived in Hong Kong since 1992. I’m also the author of the Landed series of real estate books, which includes books about Hong Kong, Japan and China. The fourth book, Landed Global, explains how to buy property across international borders. The first edition of my first book—Landed Hong Kong—was published in 2008 and became a local bestseller. About 95% of Landed Hong Kong was based on my experience buying and renovating an office, an apartment and this factory space in Hong Kong. The remaining 5% was fresh research. This is the factory after after I turned it into a multimedia studio. I published my second book, Landed Japan, in 2010. That was before I had bought property in Tokyo. Landed Japan was based on desk and internet research; interviews with developers, agents, lawyers and architects; and case studies about foreigners who had successfully bought property in Japan. Using that research, in November 2010, I bought a 22-square-meter apartment in this building in Itabashi-ku for ¥4.9 million. 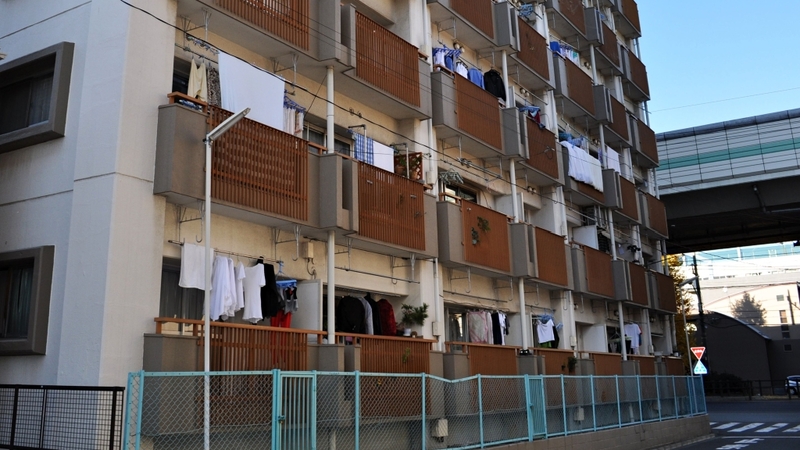 The apartment, which is next to the Shuto Expressway, was built in 1974 and came with a tenant, a retired civil servant. The purchase was handled by Akasaka Real Estate. The insights I will share with you are based on my research for Landed Japan and from nearly six years a landlord. Let me start at the beginning. From 1989 to 1992—long before I started writing books or buying property—I lived in Tokyo. I rented apartments in Koenji—still one of my favorite neighborhoods—Ichigaya-Yakuoji and Higashi Nakano. That exposed me to Japanese real estate practices—like the need for key money and a guarantor—and to the practical realities of Japanese apartments. In Tokyo, I worked for a company that produced annual reports for clients like Nissan, Mitsubishi Petrochemical and the former Bank of Tokyo. That helped me understand how Japanese businesses operate. Along the way, I made many friends and developed a deep appreciation for Japan. When Landed Hong Kong was successful, I wondered what other markets I could write about. I realized that Japan could be an interesting subject, and that’s how ended up writing about—and owning—property in Japan. Now I’m going to talk about how the role of foreigners in the Japanese property market has changed since the boom years. Specifically about foreigners’ motivation for buying in Japan and the information and services available to those buyers. Until recently, most of the foreign individuals who bought property in Japan were long-term residents. These buyers had a connection to Japan, such as a Japanese spouse or an interest in Japanese culture—like anime or sumo—that motivated them to overcome the obstacles to buying a home. The majority of these people were buying a home for their family, not investing in an apartment block. In addition to a spouse, the early buyers typically had friends, co-workers and an extended family to help them learn about the local property market, find an agent and get a mortgage. Many of these foreign buyers spoke Japanese and worked for prestigious Japanese companies that could provide key introductions. There were not many foreign buyers, so it was easy for the real estate industry to ignore them. In the late 2000s, it became more common for foreigners living in Japan to buy investment properties. Then, ski resorts like Niseko began to attract buyers from Australia, New Zealand, Taiwan and Singapore. Today, people buy property in Japan from traveling exhibitions in Hong Kong and Singapore hotels, and from companies like Mitsui Fudosan and Daikyo that have set up overseas offices. Some of these buyers have never set foot in Japan and buy properties sight unseen. Today’s buyers may have an affection for things Japanese, but they are also motivated by rental yields and capital appreciation. And where yesterday’s sumo or anime fan would look only at Japan, the new breed of buyers compares Tokyo’s nightlife with Sao Paolo’s and Niseko’s snow with that of Whistler in Canada. These people are much less tolerant of Japan’s quirks and idiosyncrasies. If you make the process too difficult or unattractive, they will buy somewhere else. Another big change is the rise of the Mainland Chinese buyer. Many of these buyers want to move their wealth out of China, and this motivation can be more important than capital gains or rental yield. By law, Chinese citizens are only allowed to take the equivalent of US$50,000 in or out of China each year. Any additional funds requires special approval. When I started researching Landed Japan, there was very little English-language information available for home buyers. Local real estate agents’ listings were almost all in Japanese. Large international brokers provided little research coverage of residential housing. Mortgage lenders and developers were the same. If you could find information in English, it was usually an annual report or corporate brochure that didn’t address the questions that a buyer would have. There were exactly two books about Japanese real estate, both of which were written for investors. The Nikkei Real Estate Market Report was useful, but was also written for a corporate audience. Some government ministries—like the Cabinet Office—continue to publish English-language materials, as do trade bodies like the Real Estate Companies Association of Japan. I learned the value of research produced by universities and think tanks and devoured stories in the Japan Times and other media outlets. But most of this was high-level social and economic information that was of limited use to a home buyer. Things have improved since 2010. But if you do an internet search for “buy property in Japan,” there is far less information available than for countries like the United States or France. That’s an issue because many real estate practices that are “normal” in Japan are perplexing to foreign buyers. For instance, zoning regulations that allow unusual combinations of buildings, like the ones in this image. Other examples include the explanation of important matters; Japanese addresses; earthquake insurance; property taxes; REINS listings; the use of paper-and-hanko–based systems; Japan’s tenant protection laws; and—importantly—banks’ reluctance to lend to foreigners. When I started researching Landed Japan, obtaining service from local companies—in Japanese or in English—was difficult. I contacted dozens of developers, agents and banks, some of whom simply said “no” or ignored my requests for information. Others gave me the run-around that happens when people want to say “no” but don’t want to offend you. Through persistence and luck, I found people and companies who were willing to help. But if I was a buyer and not a writer, I would have simply given up. Clearly, Japanese companies in Japan have no obligation to turn themselves inside out to serve foreign customers. But there is money to be made and some companies—like BIC Camera and the duty free stores in Akihabara—are actively courting this market. It’s OK to say “no” if your organization isn’t interested in these customers. But you should partner with a company that does want to serve this market, so you can benefit from referrals. If you do want the business, ensure your front-line staff, such as receptionists and salespeople, have the training and resources they need, and the company as a whole sees these buyers as an opportunity and not a problem. And don’t worry about having perfect English. Most people are willing to meet you half way. To summarize, you will be more successful serving foreign buyers if you understand their motivation; if you are prepared to explain the nuances of Japanese real estate and if you have systems and people who are ready to serve those clients. That sounds like a lot of work, doesn’t it? But I think it’s worth the effort, because—from a foreigner’s perspective—Japan has 10 powerful advantages. Let me give you some examples. First, in comparison to many places, Japan offers excellent value. In Hong Kong, where I live, HK$8 million—or roughly ¥100 million or US$1 million—will buy you about 400 square feet of usable space in a 20-year-old building in Midlevels. That’s about 11 tsubo in a nice, but not a top-end neighborhood. Prices in Singapore, Shanghai and Beijing are similar. Furthermore, property prices in Japan do not correlate with prices in Hong Kong, Singapore, Shanghai and Beijing. That lack of correlation makes Japan a useful addition to a balanced property portfolio. In Japan, it is easy to own freehold land. Contrast this with Hong Kong, where all of the land—except the ground under St. John’s Anglican Cathedral in Central—is owned by the government and leased to buyers. Mainland China is similar to Hong Kong, except no-one knows what will happen at the end of the government land leases. In the Philippines and Thailand, foreigners can own condominiums, but not the land under the building. This makes Japan an inviting and safe place to invest. Third, Japan doesn’t discriminate against foreigners with added taxes or restrictions. In Hong Kong and Singapore, for instance, people who are not citizens or permanent residents pay higher taxes when they buy property. In Canada, when a non-resident sells property, the government withholds 25%–50% of the proceeds until the owner can prove that all the taxes have been paid. In Australia, foreigners cannot buy pre-owned homes without special permission from the government. Fourth, Japan’s seismic engineering is superb. That not true in many earthquake-prone places. For instance, in February 2016, after a magnitude 6.4 earthquake struck Taichung, Taiwan, the Weiguan Golden Dragon Building collapsed killing 114 people. The building collapsed because the walls were filled with empty cooking oil cans to save on the cost of concrete. In the past, Japanese homes were criticized for having a 30-year lifespan, under the “one home for one generation” concept. Today, developers are building long-lifespan houses and apartments that can be renovated. And Japanese homes now incorporate environmentally friendly designs and components, like the solar system on the roof of this home. Fifth, for landlords, the high yields in Japan are a key draw. Net yields of 5%–6% are relatively easy to obtain. If you are willing to assume a little more risk with an older building in a less glamorous location, even higher returns are possible. On the other hand, in China’s tier-one cities—Beijing, Guangzhou, Shanghai and Shenzhen—yields are so low that investors typically leave the interior of new apartments unfinished, because the rental return doesn’t justify the cost and aggravation of fitting them out. Sixth, Japanese tenants are stable and well behaved. It’s not unusual for people to rent the same home for decades and, in my experience, tenants’ demands for improvements and renovations are quite modest. And while there are exceptions to every rule, the vast majority of Japanese tenants pay their rent on time with very little fuss. Seventh, Japan is an orderly, law-abiding society. The rule of law is well established and law suits are relatively rare. Furthermore, Transparency International ranked Japan as the 18th least corrupt country its 2015 study, well ahead of France, Taiwan, South Korea and Italy, to name just a few countries. Eighth, Japan offers excellent public infrastructure. If you live in a city like Bangkok or Jakarta, where traffic is unmanageable, Japan’s efficient, reliable public transportation is a joy. When it comes to culture, festivals like Fuji Rock, as well as the country’s parks, architecture, Michelin-starred restaurants, art museums and concert halls make Japan a great place for a pied-à-terre. Ninth, despite Japan’s reputation for being costly, it represents a bargain for shoppers and diners. In Japan, four adults can eat and drink well for US$100, something that is very difficult in Hong Kong or Singapore. Finally, Japan’s blue skies are a welcome relief from cities like Guangzhou, where choking air pollution is common. Even relatively clean cities like Hong Kong and Singapore suffer from the same problems when the wind blows the wrong way. Those are just a few of the attractions that foreigners see in Japan today. Looking forward, I see three key opportunities for foreigners investing in Japanese property. One of the most promising is tourism. The Japanese government has set a target of 40 million visitors by 2020 and 60 million by 2030, and is working to legalize casinos. But Japan suffers from a shortage of hotel rooms. According to one estimate, with 25 million visitors per year, Japan has a shortfall of 10,000 hotel rooms. That represents an investment opportunity for everything from minpaku hosts and budget hotels to integrated resorts. And tourism investments are made even more attractive by the government’s plan to increase foreign direct investment in Japan to ¥35 trillion by 2020, more than double the amount recorded in 2012. Second, in a part of the world where space and fresh air are at a premium, Japan’s rural areas have great potential. Whether they are used for artists’ communities, vacation homes, hubs for research and development or healthcare centers, many of these depopulated communities offer inexpensive land, transport infrastructure and natural beauty. Furthermore, the government’s tourism push is encouraging people to visit Okinawa—which has excellent scuba diving—and other destinations outside of Tokyo, Osaka and Kyoto. Immigration reforms will see more skilled and unskilled workers enter Japan, creating additional housing demand. Finally, there is long-term potential in Japan’s agricultural sector, where the government has set a target of increasing the value of food exports to ¥5 trillion per year by 2030. Japan’s expertise in biotechnology, coupled with its reputation for producing high-quality seafood and fruit—like the ¥10,000 “perfect” melons—are an excellent start. Furthermore, Japan has 165 high-tech “vegetable factories” operated by companies like Mirai Corporation, and this market is expected to reach ¥30 billion yen annually by 2020. Efficiency gains from automation and deregulation, and from amalgamating Japan’s many small farms into larger, more competitive units will also help this process, as will the growing wealth of Japan’s neighbors and the passage of the Transpacific Partnership. Make no mistake, there are challenges ahead, including the strong yen, an aging and shrinking population, and the need for deregulation and regulatory reform. But even with these challenges, there is a growing number of foreign investors who see potential in Japan, today and tomorrow.